Is this your retirement? 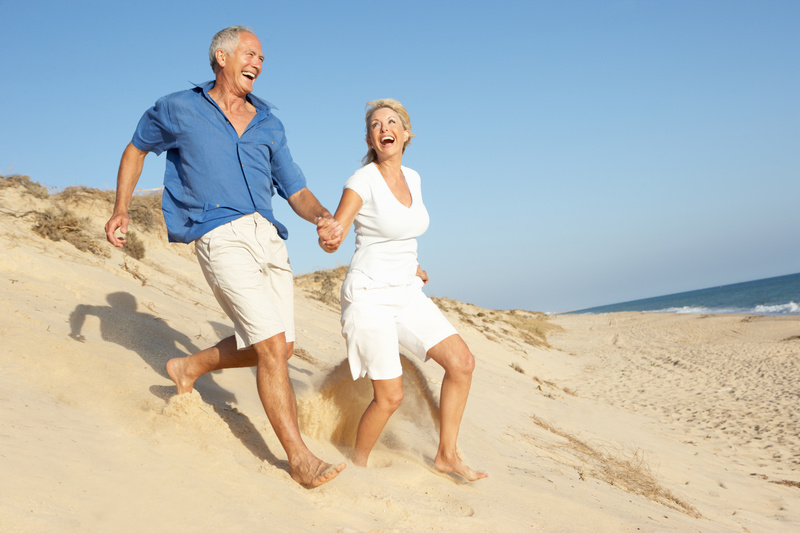 Commercials for retirement planning frequently feature retirement as one of endless vacation. In fact, I can’t think of a retirement ad that features the protagonist with a walker and in need of long term care and a new hip. But as we know, all retirement planning should involve a Walker! Get it? See what I did there?! A few weeks ago I wrote about the demographic deformation, how our aging population changes many factors about our society in everything from government services to investing. One of the government services that is likely to be affected is our health care, and that should have a profound impact on your investing and retirement plans. It isn’t surprising that health care costs would rise as a population ages. Living longer doesn’t just mean a longer life, but one in which treatment costs rise in accordance with the number of treatable ailments. Typically this has meant that the older you get the more you cost the system. The picture is more complicated though. Costs rise as you get older because you get closer to death, and the most expensive and costly treatments correspond to end of life care. High cost users (HCU) account for only 5% of people treated by OHIP, but use 61% of hospital and home costs. Being old though doesn’t automatically make you a HCU, but it does make it more likely. The most expensive HCUs are actually infants, but as a percentage only account for 3% of all infants that see doctors. By comparison of the people over the age of 80, 20% will be HCUs. These costs come from a study done in 2013, but reflect 2009 numbers. From the standpoint of the government, HCUs represent a serious challenge to managing the long term sustainability of public health care. If you are over the age of 65 and seeking medical treatment there is a good chance you will be costing the system a great deal, which is not a problem when the number of people over the age of 65 is small relative to the rest of the population. 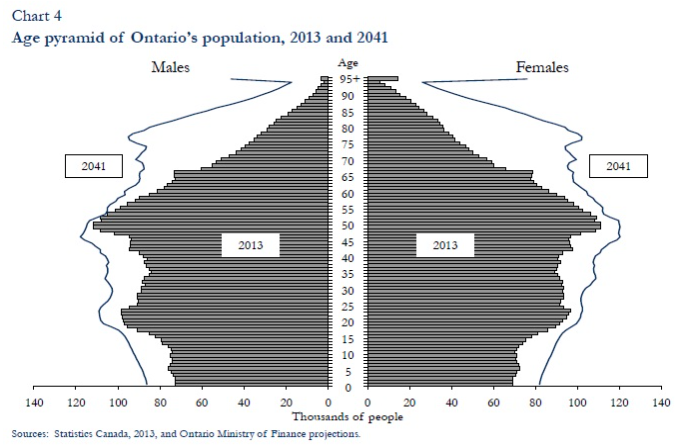 But look at the projected population for Ontario. Our population is aging, and the costs to the system are expected to be enormous. Which is a problem, because the costs of the system are already enormous. Healthcare in Ontario is already 38.5% of the budget ($50.8B), the single greatest expense within the province, and is expected to grow at a rate of 1.2%. That’s not because that’s the natural rate of growth (nationally hospital spending averaged 6.7% annually between 1998-2008), but because the province is frantically looking to contain costs and reign in the ballooning debt we already face. Ontario today is now the world’s most indebted sub-sovereign borrower, double the size of California. 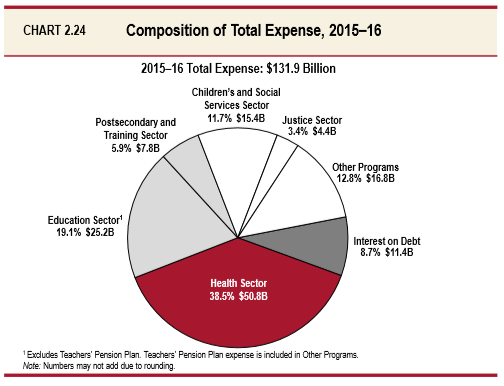 From the Government of Ontario 2015 budget. If you are in your 50s and planning your retirement and taking an honest look at these three factors: rising costs, aging population and ballooning debt, would it still be reasonable to expect that OHIP will cover all your costs when you are in your 70s? That you could simply dismiss the costs of your future healthcare as not being solely your responsibility? Canadians today already expect that they will have out of pocket medical expenses in retirement, to the tune of about $5400 a year. 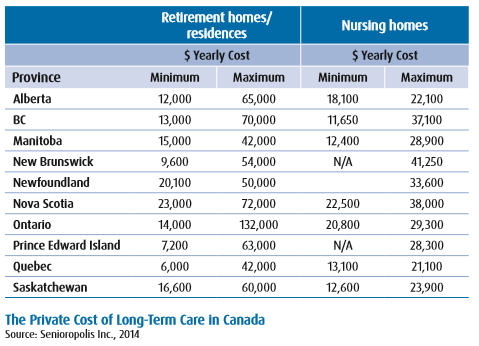 That number doesn’t include the cost of either nursing homes or retirement homes which can vary wildly based on your needs. But according to Statistics Canada there is a 30% chance you will need long term care by the age of 65, and a 50% chance of needing it by 75. Imagine the costs of health care when there are more people in the country over the age of 65 than under the age of 14 (hint, that’s in the next 6 years). I don’t like to fear monger, but retirement plans should include the need of long term medical costs and younger people today looking to retire in the next two to three decades should not assume that the healthcare system we have now will be in place in the way we have come to understand over the next twenty years. Even today it was announced that Ontario doctors are planning a charter challenge after having their fees were cut by 6.9% in the past year, an attempt by the government to cap doctor’s costs at $11.6 billion. Our health care costs are rising, and our health care service will be changing to match. Your retirement plans should be changing too. ← Can Your Kids Be Made Money-Smart?